This year we finally did it. 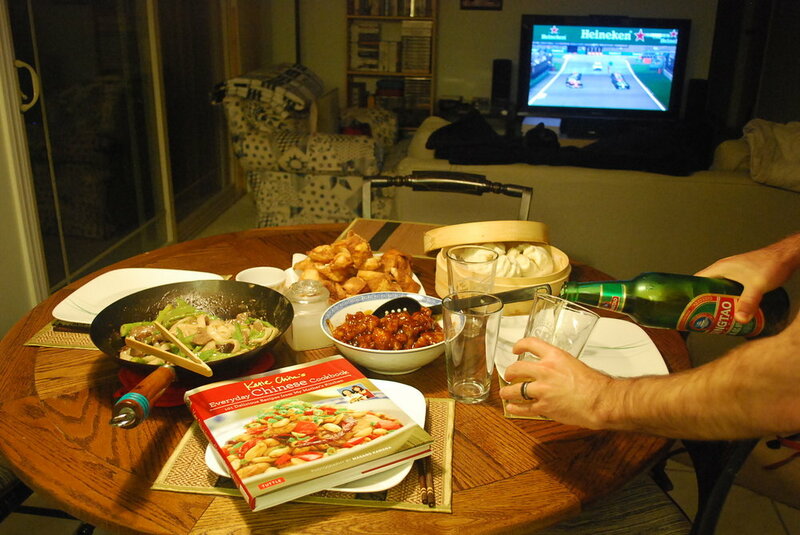 We made our own Chinese food! And because I can't resist a cooking challenge we made three dishes, two of which were fried and none of which I had ever made before. But the pork buns were store bought, so I let myself off the hook there. 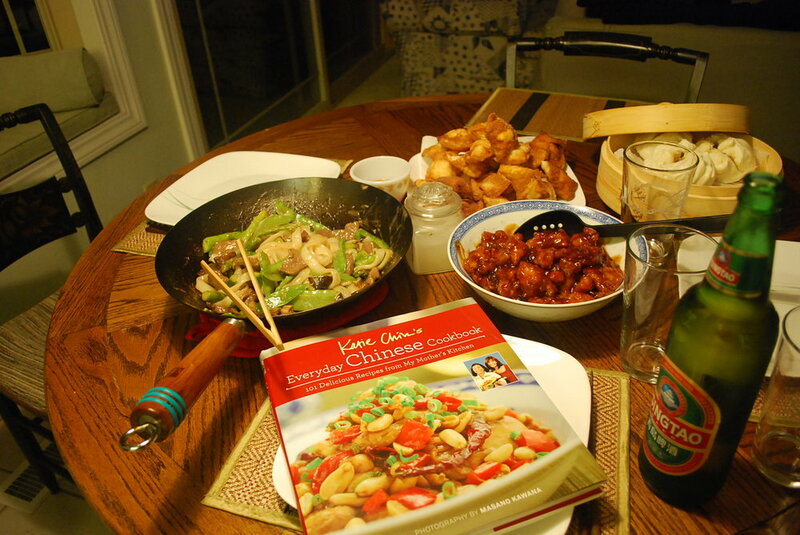 A big thank you to Luiz who provided the inspiration in the way of a new cookbook for my birthday: Katie Chin's Everyday Chinese Cookbook: 101 Delicious Recipes from My Mother's Kitchen. Despite the juggling, none of these dishes turned out to be overly complicated or difficult. Just a little time consuming with the need to make a sauce, batter the meat, and fry for the orange chicken, but perhaps that is what makes it so very tasty. When I make these dishes over again I will halve the sugar in the orange chicken and double the veggies in the chow fun because those are my preferences, otherwise, they are delicious! Lay one wonton wrapper on a clean surface. Brush edges with beaten egg, then place a heaping teaspoon of crabmeat mixture in the center. Fold the bottom corner of the wonton wrapper over the filling to form a triangle and seal the edges. Pinch the two folded corners together. Repeat with remaining wrappers. In a large wok or dutch oven, heat 2 to 3 inches of oil to 350 degrees F. Fry 8 to 10 wontons at a time, turning 2 or 3 times, until golden brown, about 2 minutes. Drain on a sheet pan lined with paper towels. Serve immediately with Sweet and Sour sauce. In a large bowl, combine the chicken pieces, egg, 1 tablespoon cornstarch, 2 teaspoons soy sauce, 1 teaspoon salt and the white pepper. Cover and refrigerate for 20 minutes. Heat vegetable oil in a wok or deep frying pan to 350 degrees. Mix flour, 1/2 cup water, 1/4 cup cornstarch, 1 tablespoon vegetable oil, 1/2 teaspoon salt and the baking soda. Stir the chicken and remaining marinade into the batter until well coated. Fry about 15 pieces at a time until lightly browned, turning frequently, about 3 minutes. Drain on a paper towel-lined baking sheet. Increase oil temperature to 375 degrees. Fry all of the pieces at one time for 1 minute (this is the secret for getting crispity-crunchy results). Drain on paper towel. Heat sugar, chicken broth, orange concentrate, vinegar, 1 tablespoon vegetable oil, 2 teaspoons soy sauce, 1/2 teaspoon salt, garlic, red pepper flakes and orange zest to boiling in a medium sauce pan. Mix 1/4 cup cornstarch and 1/4 cup water; stir into the sauce. Cook and stir until thickened about 10 seconds. Bring to a boil. Remove from heat and pour over chicken pieces. Soak mushrooms in hot water until soft, about 20 minutes, and drain. Remove and discard stems and cut caps into ½ inch pieces. In a bowl, toss beef, 1 tsp of cornstarch, 1 tsp salt, 1tsp sugar and the pepper. Cover and refrigerate for 20 minutes. Bring a small saucepan of water to a boil. Add snow peas and blanch for 1 minute. Using a slotted spoon, transfer snow peas to a bowl of ice water to stop cooking. Drain and set aside. In a small bowl, mix 4 Tbsp of the chicken stock with the remaining 2 Tbsp of cornstarch, the remaining ¼ tsp salt, the oyster sauce and the remaining 1 tsp of sugar. Set aside. Heat 2 Tbsp of the oil in a wok or skillet over medium-high heat. Add the beef, ginger, and garlic and stir-fry for 2 minutes. Remove beef from the wok. Wash and dry wok, then heat the remaining 1 Tbsp oil over medium-high heat. Add the drained mushrooms and the asparagus and stir-fry for 2 minutes. Pour in the remaining ½ cup of chicken stock and the cornstarch mixture and cook stirring continuously, until the sauce thickens and all the ingredients are nicely coated, about 2 minutes. Add the blanched snow peas and cook for 30 seconds. Add the beef and cook, stirring continuously until the beef is hot. Pour beef mixture over noodles in individual bowls, or mix noodles in, to coat with sauce. Get the book or check out her website. Many more great recipes where these came from! All these recipes made an ungodly amount of food so the three of us ate very well and we had lunch for the entire week! I do love a FULL fridge!